Bathroom lighting refers to a variety of fixtures that work together to create the best lighting solution for your bathroom. Follow this bathroom lighting guide to help you select the right lighting scheme for your bathroom. 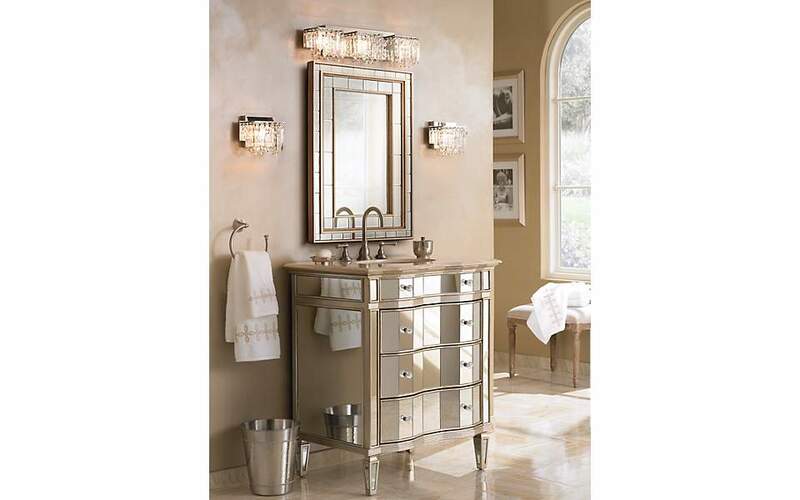 Task bathroom lights work best around the mirror and in the vanity area. Purchase two bathroom lights, one for each side of the mirror. This lighting solution creates an even spread of light, preventing shadows and splotches from showing up on your face. An alternative to two lights flanking the mirror, you can install a bathroom light above the mirror. This lighting solution saves space. You may want to purchase a lighted mirror if you don’t have the space to install any lighting in your bathroom vanity area. In particular, lighted makeup mirrors are designed to provide task lighting while taking up minimal space. Ceiling lights are great for general (ambient) lighting for the whole bathroom. This diverse category includes chandeliers, pendant lights, flush mount lights, semi-flush mount lights, and recessed lighting. You can safely hang a chandelier or pendant light in the bathroom. They’re an ideal choice if you want decorative lighting and have a high ceiling that can take hanging light fixtures. Place them at least 3-feet from bathtubs and showers for safety. Flush mounts and semi-flush mounts are ideal if you want decorative lighting, but your ceiling is too low for chandeliers and pendant lights. They install directly onto the ceiling and take up relatively little space. Recessed lights install into a hollow groove in the ceiling and take up virtually no space. They are ideal for bath areas, as well as closets and alcoves. You should choose recessed lighting if you prefer a clean, unobtrusive look for your ceiling. As long as your bathroom is properly ventilated, you can safely use any type of lighting. If you have problems with excessive moisture and dampness, install a bathroom exhaust fan onto the ceiling. As an added benefit, some exhaust fans come with a built-in light. Wall lights are excellent for accent lighting, which is meant to provide a complement to your general lighting or a set an atmospheric mood, or highlight certain objects or focal points. Accent lighting can also be used to illuminate specific areas or objects. Place lights around wall art and décor in order to highlight them. Follow these tips to help you find the right size light for your bathroom. For an average size bathroom, buy bathroom lights that are 18-inches wide or less. If the spots are tight and narrow, then buy smaller models that are 12-inches or less. 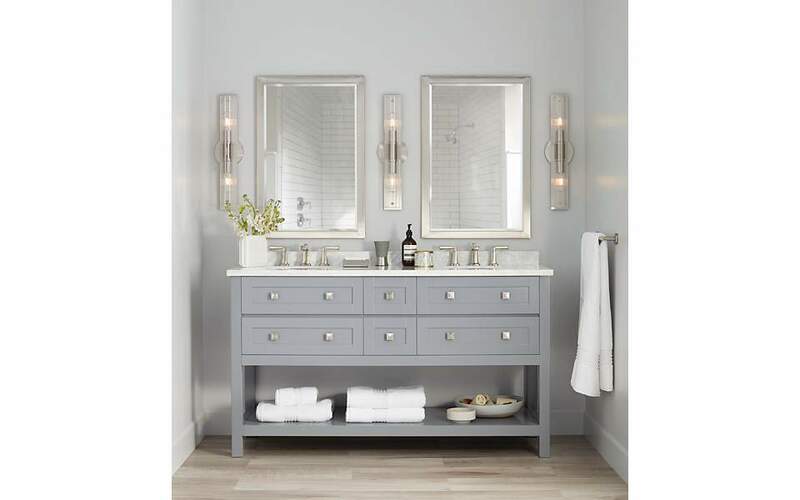 For a larger bathroom, start from lights that are 19-inches wide and go wider. Purchase a bathroom light that is 19 inches wide or longer, and place it 1 to 5 inches above the mirror. 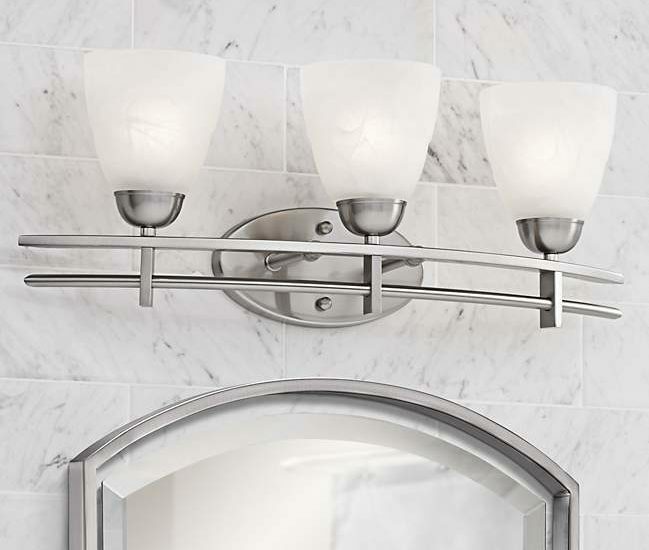 This will usually be a multi-light fixture or long bath bar that will provide a sufficient light output. Instead of thinking about the width and height, consider the number of lights in the design and the wattage, or lumens output. For a larger room, choose a design with a larger light output. For wall lights, the standard installation height is about 75 to 80-inches off the ground, which is usually being above eye level. If you have several wall lights, try installing them about 28-inches apart to create an even diffusion of light. Consider flipping the fixture around and installing it vertically instead of horizontally. This will clear up precious wall space for you to install more lights. You may want brighter illumination in the bathroom, especially in larger bathroom spaces or around the vanity area. In this case, you should buy use a light bulb with a higher lumens count. As long as it fits the wattage and base of the recommended bulb, it should work fine. Some bathroom lights will have LED lights built into the design. When it does, lumens count of the LED will be listed in the product description. For a warm, inviting atmosphere, use bulbs or LEDs with a 2700K color temperature range. These types of bulbs have a warm white light output that’s ideal for the bathroom. On the other hand, if you want a colder white saturation for a cleaner look, we recommend using bulbs with a 3000K or higher color temperature. Go with LEDs. Our bathroom lights can use LED light bulbs. As long as it fits the recommended base and wattage, an LED bulb can be used in place of an incandescent or halogen bulb. We also carry many bathroom lights that have built-in LEDs. This means that that the LEDs cannot be removed or replaced like regular light bulbs. Check the product description to see the given lifespan of a built-in LED light. Wall dimmers can be used to customize the level of lighting and mood of the bathroom. Set a romantic atmosphere with a low level of lighting one day, and then create a bright white look with a high level of lighting the next day. Most of our bathroom lights can take dimmers. It will often be noted in the product description whether a lighting fixture is dimmable or non-dimmable. If the fixture is dimmable and takes light bulbs, be sure to purchase a bulb that is also dimmable.